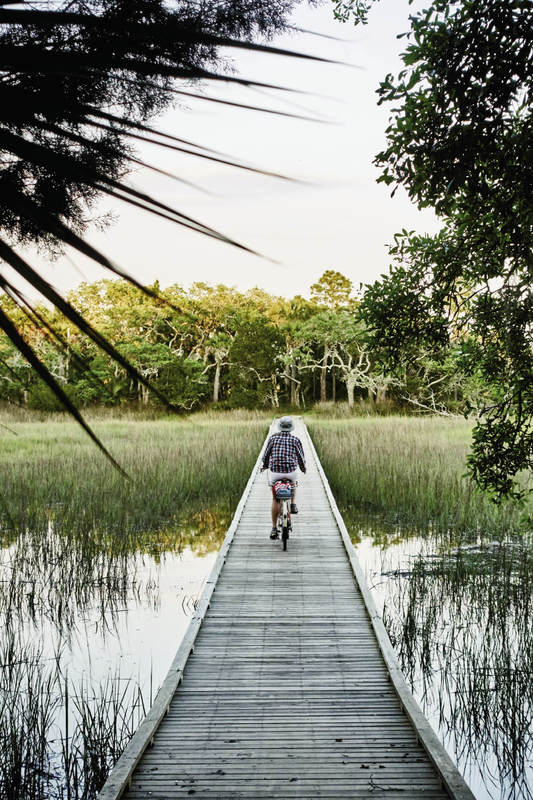 Edisto Island: The final miles of Highway 174 are well-marked for cyclists; one of the oak-shaded campsites at Edisto Beach State Park; pedaling here offers views of tidal creeks on a mix of paved and sandy roads and paths in the maritime forest. 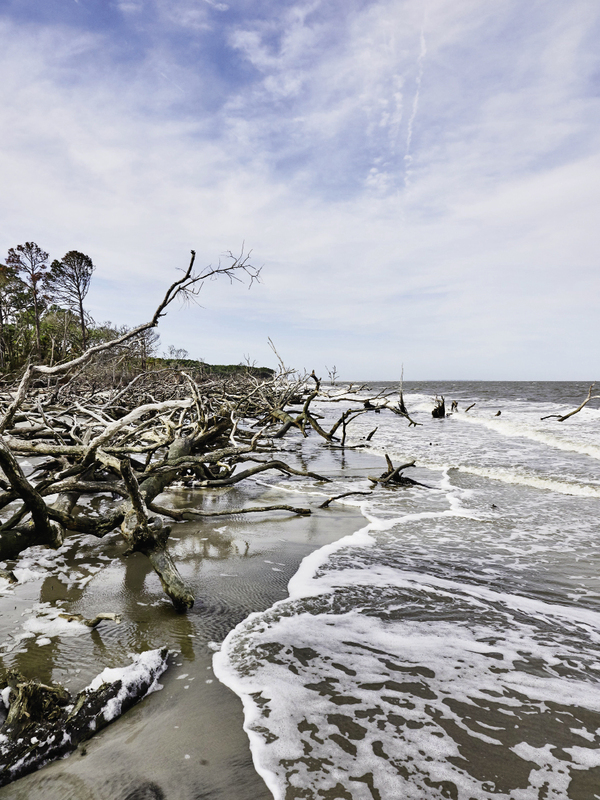 Edisto Island: There are no worries about parking when you pedal to the beach, which is known for great shelling. Hunting Island State Park: pine needles and cones line trails at the state park, where you might come across a heron rookery. 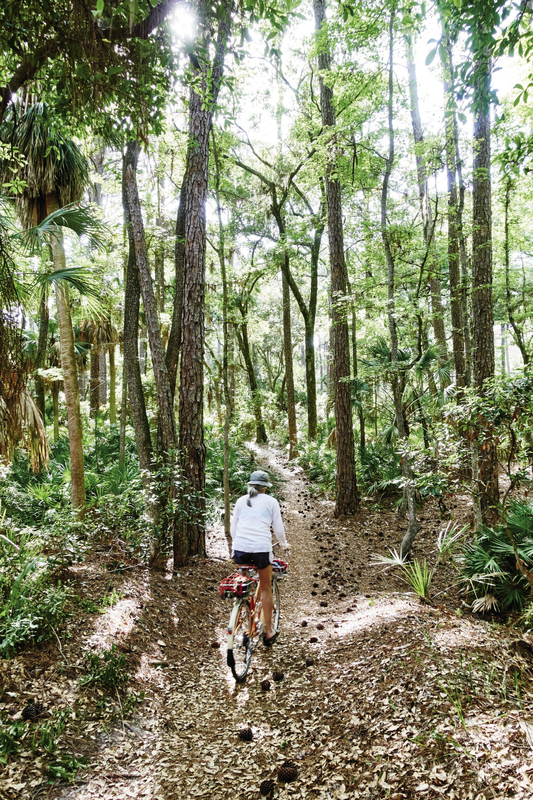 Following the route of a former rail line, the West Ashley Greenway is a local treasure. 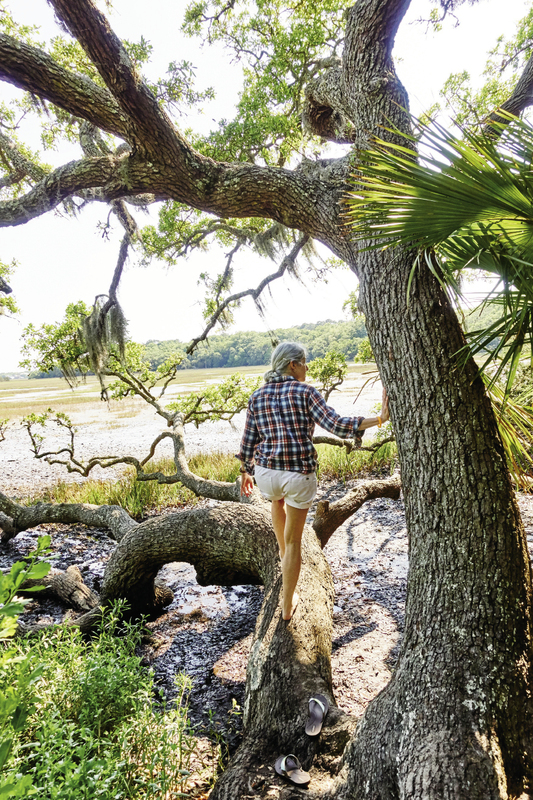 The eight-mile, no-car path skirts saltwater creeks and offers views of the Stono River, as well as some tree shade, while passing through neighborhoods from Windermere Shopping Center on Folly Road all the way to Main Road on John’s Island. 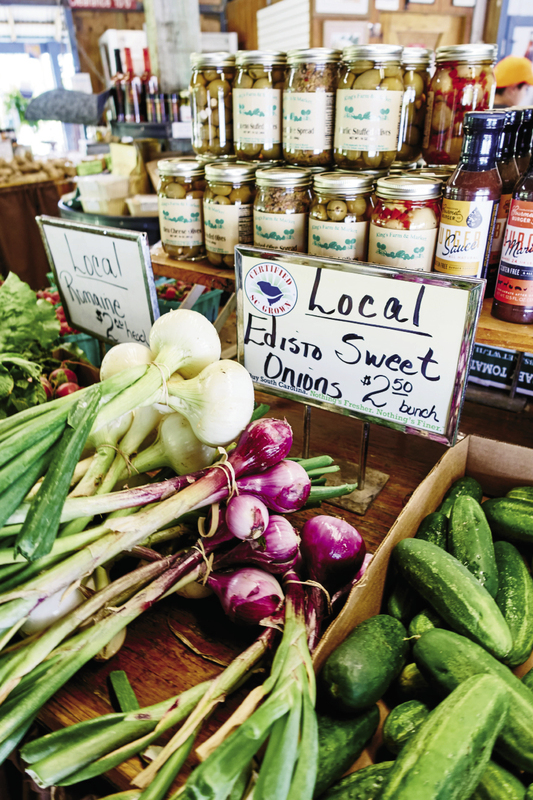 We often cycle the full distance on a there-and-back ride from Earth Fare, and then one day wondered—what if we just kept going and pedaled for 40 more miles to Edisto? From Charleston, that would involve navigating Highways 17 and 174. Taking the idea seriously, we tried a few test miles but quickly realized it’s far too dangerous to share these roads and their narrow or nonexistent shoulders with cars and trucks. I wasn’t giving up, though. We began to hatch a new idea for transportation. 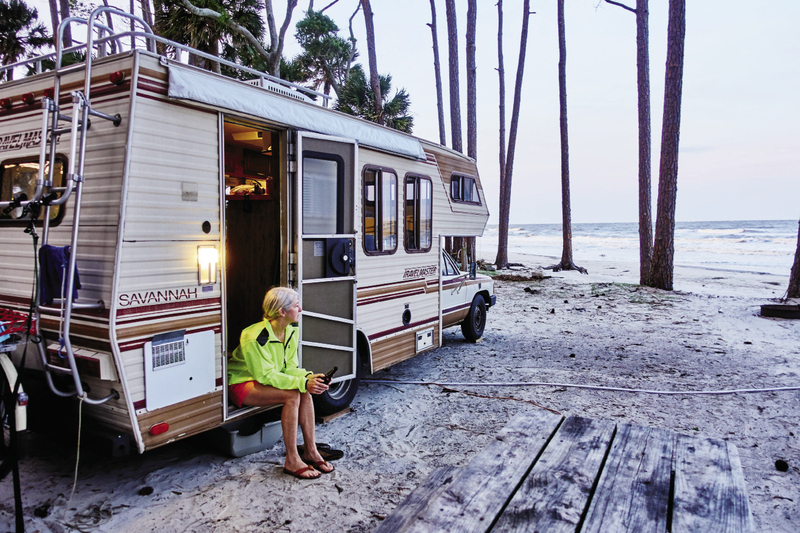 Instead of cycling the entire way, we’d take our recently acquired RV, a 1985 Travelmaster. As a bonus, bringing the camper would mean that mellow Sparky, our 16-year-old hound, could join us—another first for a bicycling trip. I couldn’t wait. After loading the bikes, gear, and food, we hit the road and arrive at our first stop, the Live Oak Campground at Edisto Beach State Park, at the earliest check-in time, around 2 p.m. It’s a sunny day on Edisto Island, but the campsite we’re assigned is in dappled shade, and the RV fits nicely under an oak tree. 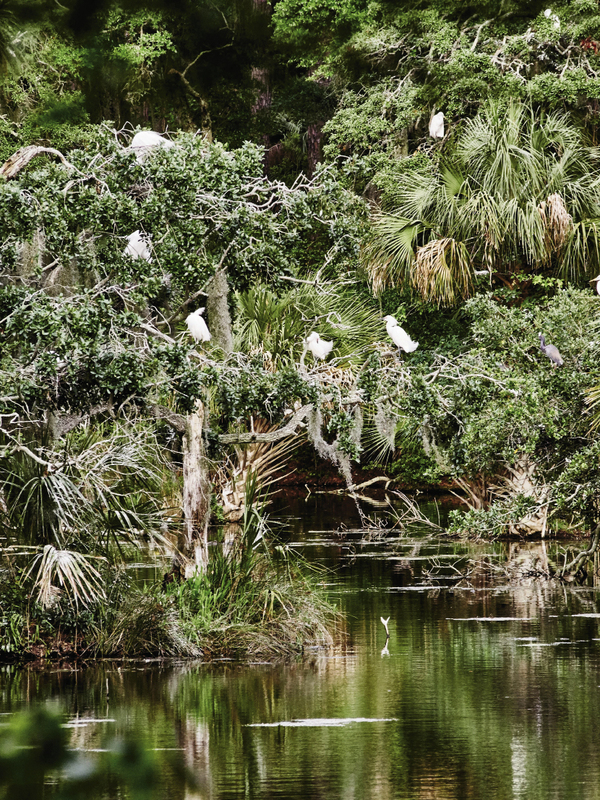 From there, I walk less than a dozen yards to see fiddler crabs sideways-skittering across the pluff mud of the marsh and dark squirrels zipping along branches that bend and twist over the flats. 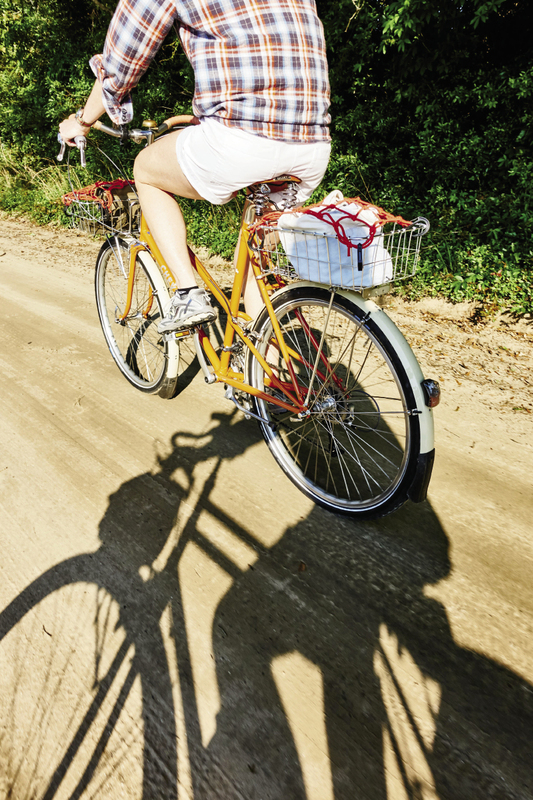 The tide’s out, so we hop on the bicycles as soon as we can get them off the RV’s rack. 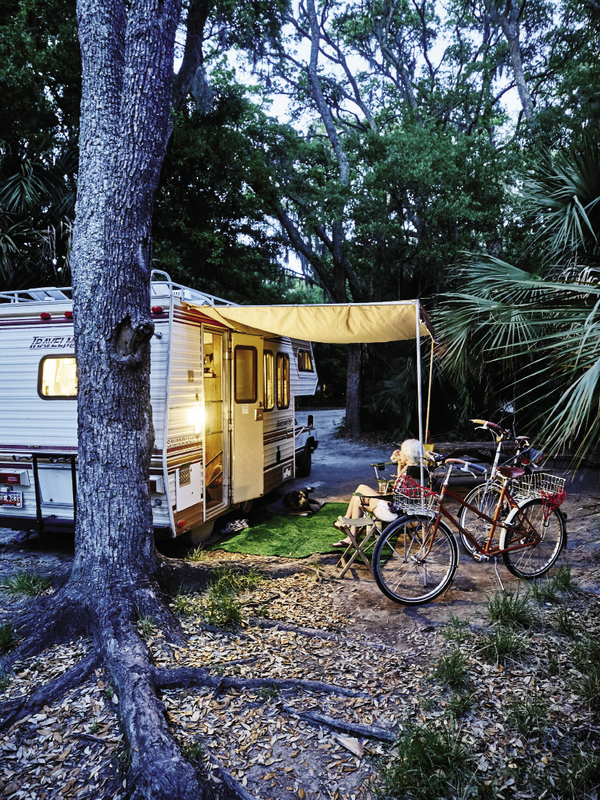 This campground is perfectly situated for exploring Edisto by bike. 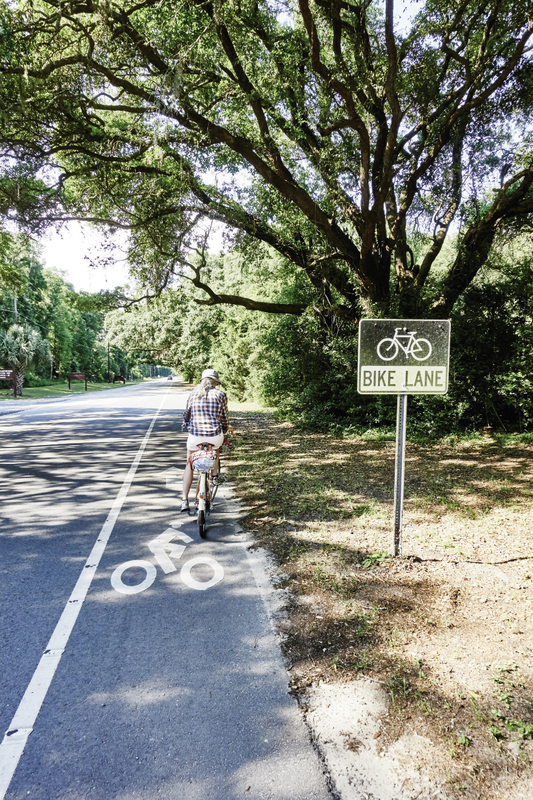 The final miles of Highway 174—from the Botany Bay Plantation turn-off all the way to the beach—offer up wide, well-marked bicycle lanes. 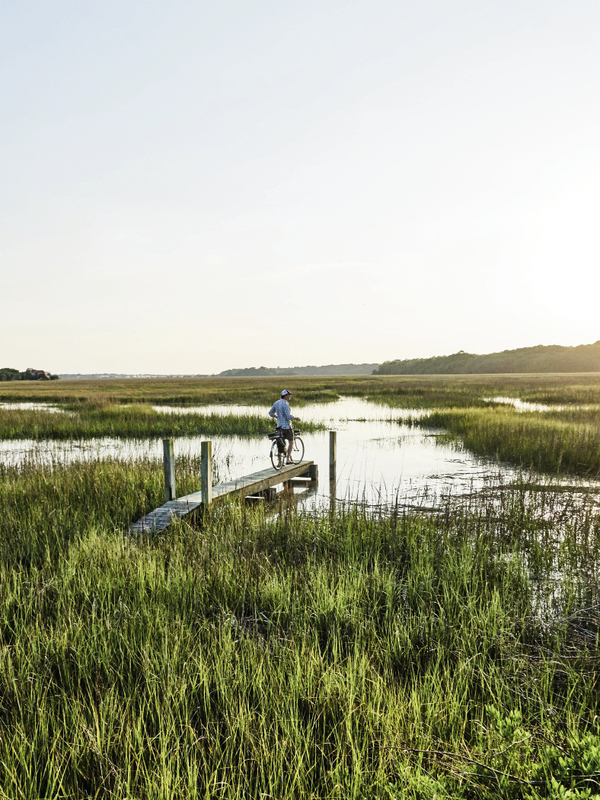 That afternoon, we cruise down roads that connect to 174, following Red House, Crisp, and Shell House roads to see cottages, pine woods, long spits of sand, and hummocks in the marsh. It’s a quiet island, grown over with nature—just what I was yearning for. 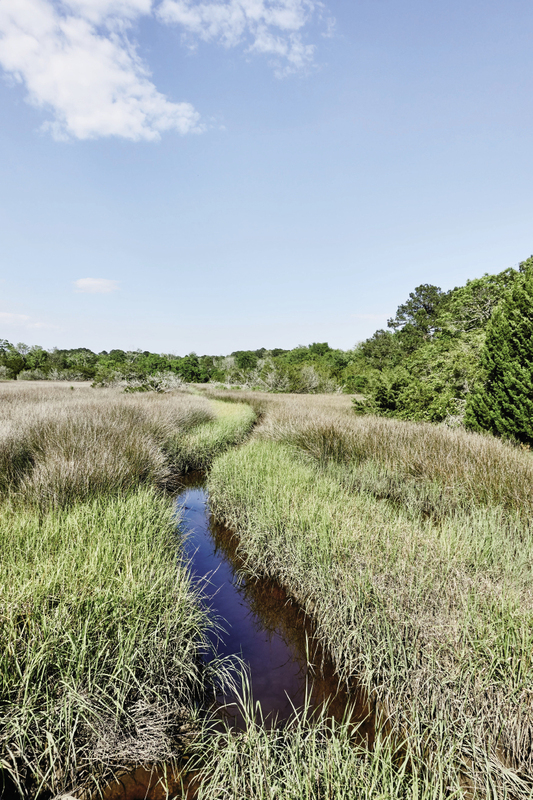 It’s amazing to find so much of its 68 square miles preserved in public land or conservation easements by the Edisto Island Open Land Trust. We peek in the windows of Po Pigs Bo-B-Q to see the walls hung with oversized historic photos of island scenes (it’s not open that day, but it has been a favorite on other trips), and we stop at The Edistonian, a gift shop, gallery, and general store, and buy several 35-cent postcards with pictures of sharks’ teeth. As the sun goes down at the campground that night, the woods are full of birdsong and squirrel chatter. The next morning, we rise early to cook breakfast in the RV and get back on the bikes to head to the beach. 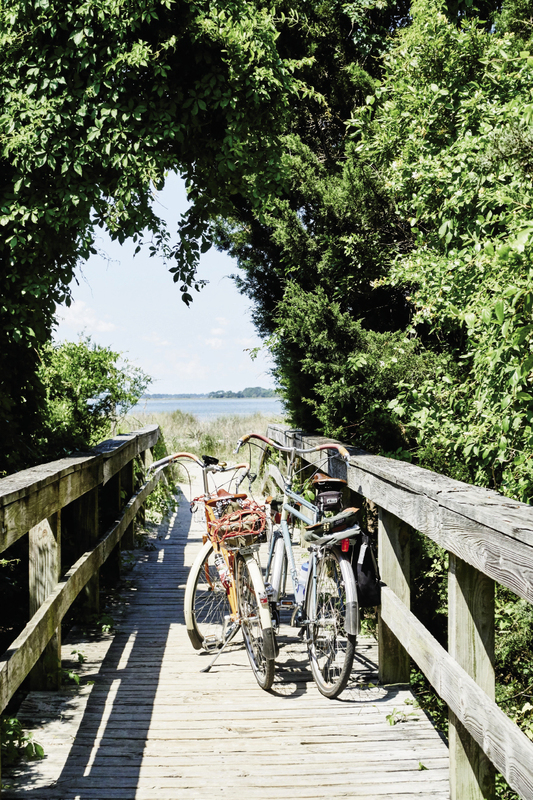 The trip is a cinch via a trail from the campsites through the woods and across a bike- and pedestrian-only boardwalk. 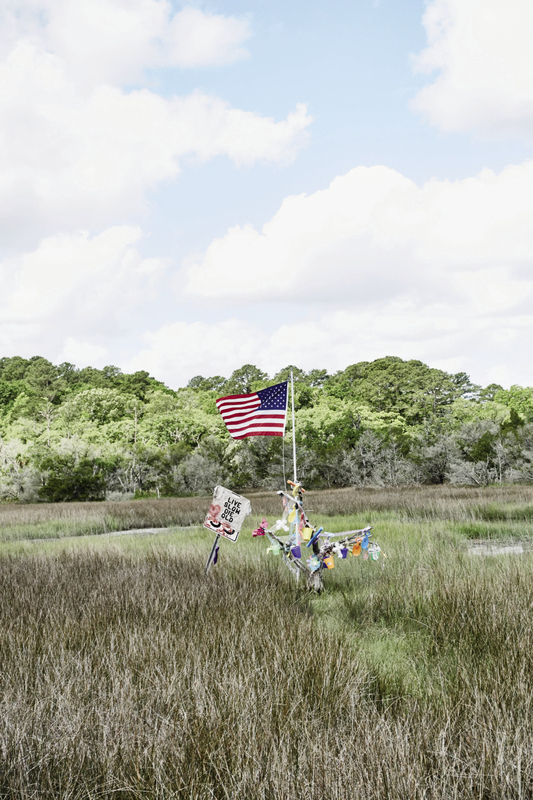 It then joins a causeway path on Highway 174 to Edisto Beach, reminiscent of the causeway on Ben Sawyer Boulevard to Sullivan’s Island, and the entire journey is less than a mile. 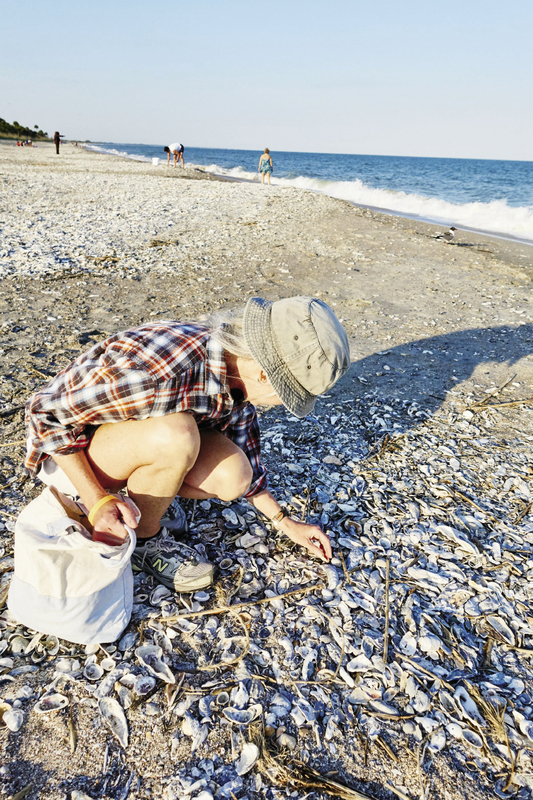 The shoreline on Edisto Beach is deep with shells, and people are sorting through them, as well as swimming and fishing in the surf. We do our own exploring and shelling for a while before hopping back on the bikes. Down Jungle Road, the SeaCOW Eatery is packed with a breakfast crowd, and we pedal on the backside of the island, passing houses and the seafood shops on Docksite Road. 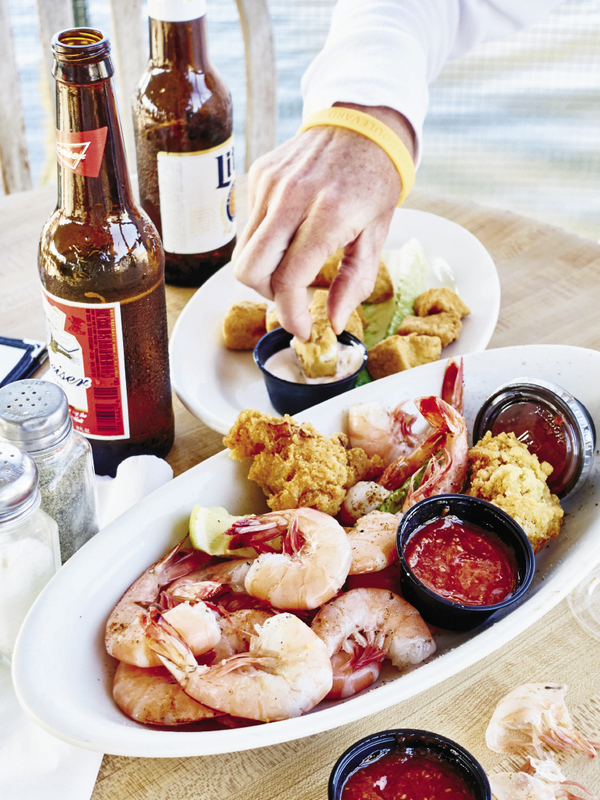 That afternoon we go for beers and shrimp at Dockside Bar & Grill, which has a vibe similar to the decks and docks of Bowens Island. We pass Whaley’s Restaurant and Bar, another favorite watering hole and a fixture here since 1948. At beach access paths that have just three or four car parking spaces, we never have to worry about finding a spot. That’s one of the best parts of cycling. And because we have the RV, when we drive out from Edisto the next morning, we can easily stop to shop the bins of vegetables, local honey, and pies at King’s Farm Market and buy a few essentials—a bag of boiled peanuts, ears of sweet corn on the cob, and a heavy container of homemade banana pudding complete with cookies, banana chunks, and real whipped cream. 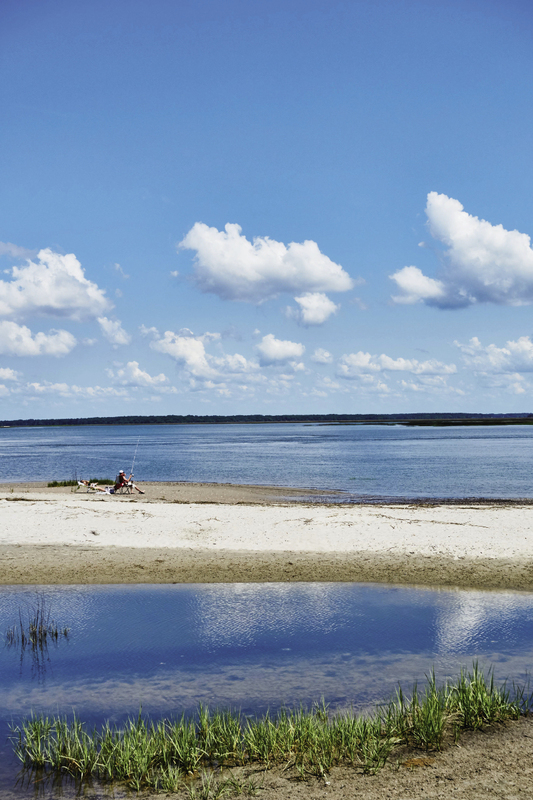 Our next destination, Hunting Island State Park, is just across the St. Helena Sound. 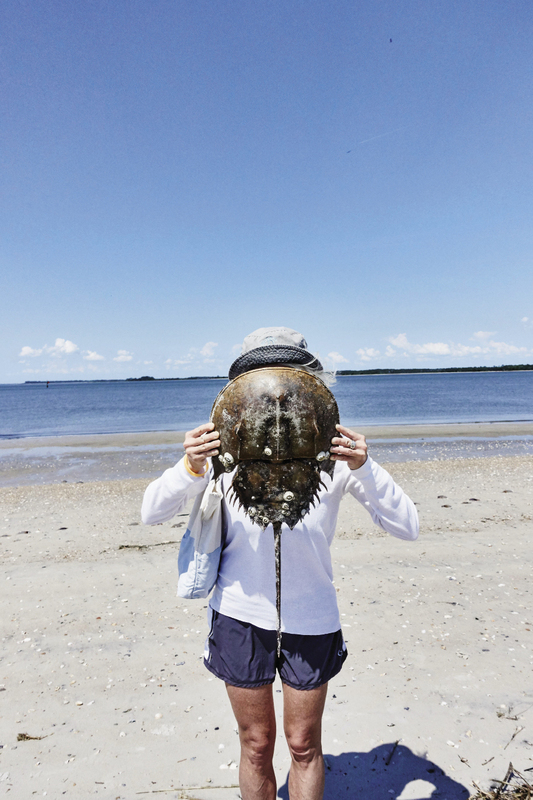 (We could practically see the park in the distance when we walked along the southwestern end of Edisto Beach and found the shell of a giant horseshoe crab.) But since it’s about 80 road miles away, we take the RV. On the drive along Highway 21, we pull into the Gay Fish Company on St. Helena Island to buy some crab cakes and fresh shrimp. 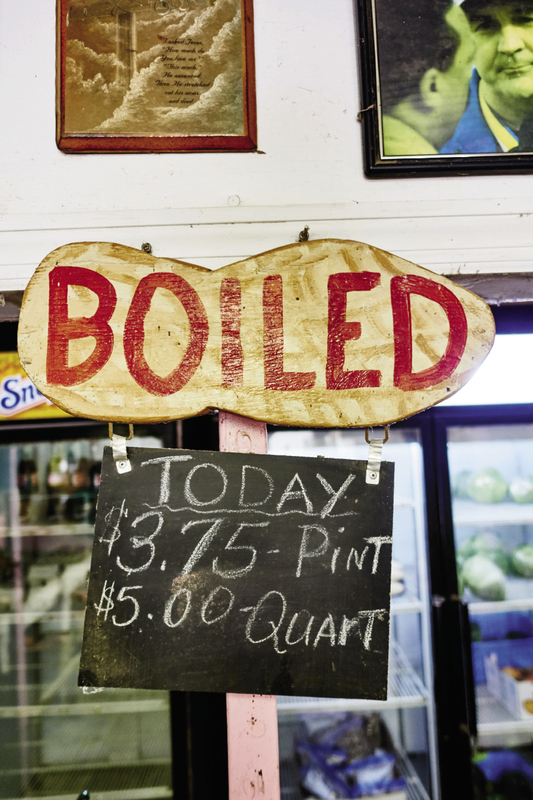 The owners of the old-school shrimp boat docks and seafood store claim to have created the recipe for Frogmore Stew decades ago—the woman at the counter makes sure we leave with a printed copy. In a few more miles, I can’t believe our luck when I see our campsite at the state park. Online, I’d booked a beachfront spot, but this one looks to be the best of the 200 or so available, at the very edge of where the maritime forest meets the beach. 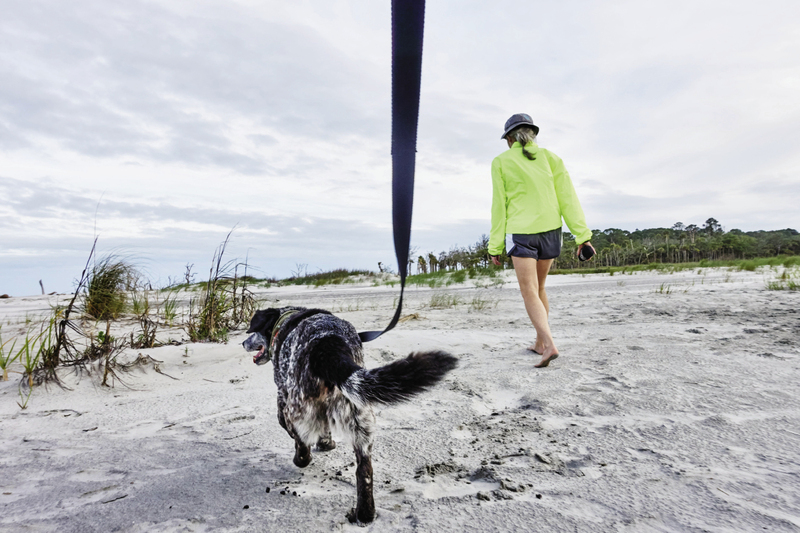 Not even a sand fence or high dunes are between us and the ocean—and it must be less than a football field’s length to the waterline. Looking at the Atlantic, I think about how since we’re sleeping in the “loft” of the camper above the truck’s cab, we’ll be able to watch individual waves rolling in at high tide. We’re that close. On the dry sections, we’re pedaling mostly on a thick floor of pine needles. 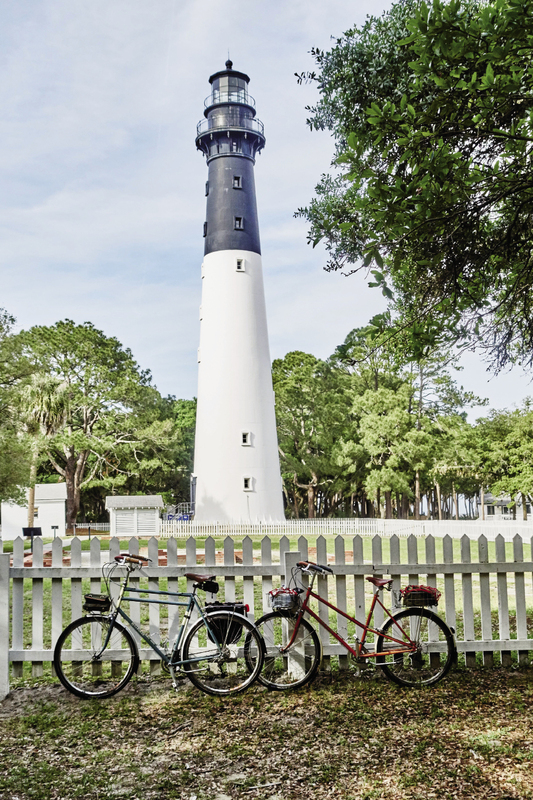 Eventually, we end up at the Hunting Island lighthouse, which is open several hours a day for climbs to the top. I’ve gone up for the terrific view on previous trips, but this time we keep riding out onto the boneyard beach of sun-bleached, wave-washed tree trunks that are partly covered and then uncovered again with each tide. It’s noisy with the windy rush of waves, but while I dodge the seawater approaching my tires, I think about how among these “bones,” the sea islands can be the most peaceful places, especially at sunset. 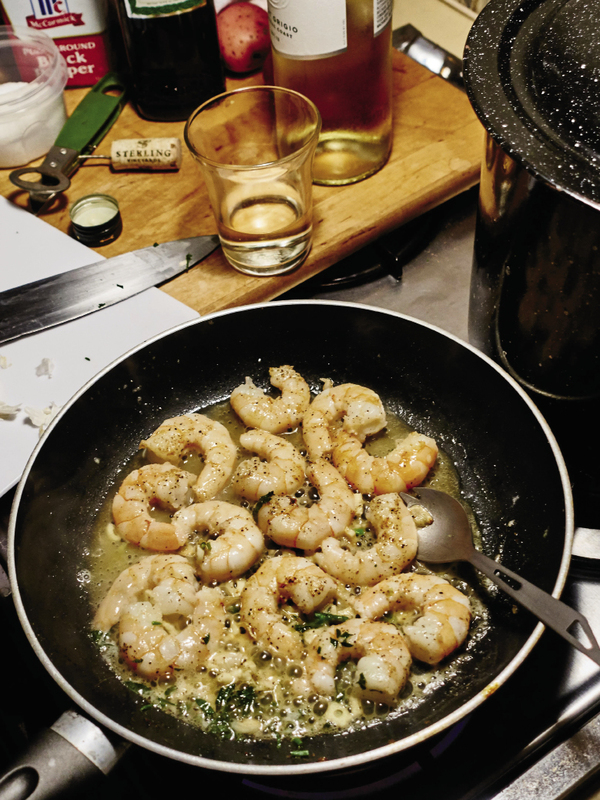 Back at the campground, we use the RV’s tiny kitchen to cook up an oceanside dinner of steamed shrimp, corn, and sweet onions seasoned with Old Bay, plus a side of crab cakes. (We don’t have sausage or potatoes on hand to make Gay’s Frogmore Stew.) Our bikes are leaned up against the rear of the camper by now, and I sit down for the meal at our site’s picnic table with my bare feet in the sand. The wind is picking up, and at dusk, we take Sparky for a walk on the beach under the silver-faced full moon. This is good living. Early the next morning, we go for one last ride. Not far from the campground entrance on Highway 21, we come to a pond edged by trees decorated in white-feathered herons and egrets. Near the marsh, it must be where the birds take shelter after fishing. Thick bushes obscure much of the rookery activity from the road, so I push aside a few branches and from my bike seat I watch the long-legged birds for a while. I’m quiet and still, and I’m not certain the wild flock notices me. That’s good. The birds have found their place in the salt air of these sea islands, and this week I have, too.